In yet another sign of the growing political significance of public procurement the UK Government today published a compact designed to reinvigorate EU economies and build “strong, sustainable and balanced” growth. 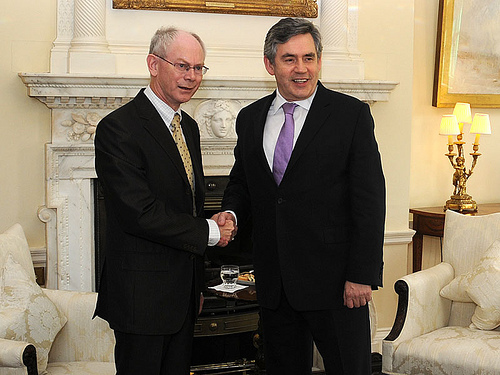 Gordon Brown met EU President Herman van Rompuy at Downing Street this morning to discuss the economic strategy, as well as climate change, security and the situation in Haiti. Use the power of public sector procurement to drive innovation, by encouraging businesses to compete in bringing innovative technologies and ideas to address specific challenges identified by public bodies. Following talks with European Council President Herman van Rompuy, Mr Brown said the compact would be discussed at a special meeting in Brussels on 11 February. Mr Brown said the strategy was needed because “the European growth ambition is not good enough for the future”. Mr Brown’s compact proposes giving the European Investment Bank access to capital markets to bring in extra private finance for companies developing new technologies. It calls for a review of the EU budget, state aid rules and public procurement processes to support new industries. It also says funds from the European Social Fund and Investment Bank should be used to develop the workforce skills needed for a low-carbon economy, while completing the single market and creating more flexible labour markets. Mr Brown said the EU had to develop free trade agreements with other countries – starting with South Korea – in the absence of a final settlement in the Doha talks on global trade. He said: “Half of Britain’s international trade is with the EU. More than three million of our jobs depend on Europe.